Lead is particularly troublesome for your health. And, it’s also hard to avoid. But, there’s a healing food that can actually help fight this toxic substance. The leaves of the coriander plant—better known as cilantro—are a healthy spice with unique ingredients that could keep lead from accumulating in your organs and tissues. Unfortunately, everyone is exposed to low levels of lead when they do such basic things as eat food, drink water, or breathe air. The dust in your house can also contain lead, as can the soil in your yard. In fact, it’s a good idea to get your soil tested before you grow any vegetables in it to make sure that lead (along with other dangerous chemicals) hasn’t accumulated there. Even very low levels of lead exposure can cause health problems. Lead affects the nervous system, and can increase blood pressure. It also attacks your kidneys and plays havoc with your reproductive system as well as your vision. 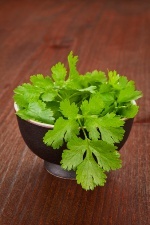 It’s impossible to avoid ingesting lead altogether, so make sure you add some cilantro to your diet. Researchers recently discovered that cilantro reduced the amount of lead that accumulated in the bones of mice exposed to the chemical. Not only that, but coriander also helped to remove lead that had already settled in the kidneys. In addition, urinary excretion of a substance called “delta-aminolevulinic acid” (or ALA), which is known to increase with lead intake, was significantly decreased after administration of cilantro. Cilantro has a distinct taste that can add a real zing to many dishes. Add it frequently to your diet, and know that, once digested, it will get to work removing lead from your body. Aga, M., et al., “Preventive effect of Coriandrum sativum (Chinese parsley) on localized lead deposition in ICR mice,” J. Ethnopharmacol. October 2010; 77(2-3): 203-8.